Posted on Sat, Mar 10, 2012 : 10:11 a.m.
1. The Huron High School principal sent out an email to parents alerting them of a game known as the "cinnamon challenge." What is the "cinnamon challenge"? 2. Former Michigan football captain David Molk recently brushed off criticism about his NFL draft-pick status by using which quotation from a song? 3. An Ann Arbor teen was recently on the Ellen DeGeneres Show for delivering a petition that asked what? 4. 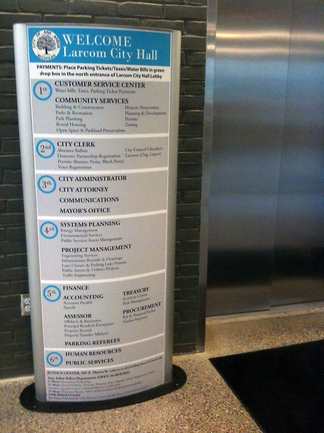 What does the pictured sign at city hall have to be replaced? Sun, Mar 11, 2012 : 6:48 a.m.
#4 - It's ironic that the answer to number for is D) Spelling Errors and you accidentally wrote &quot;What&quot; instead of &quot;Why&quot; for the question. Were yo u just being clever? Sat, Mar 10, 2012 : 6:54 p.m.
For question #1, you are just giving teenagers ideas to do more stupid things.